Batch cook this recipe on the weekend for two meals for 4 people or 1 meal for a larger family. Benefits: This is an all-in-one meal although a serving of salad or fresh raw veggies on the side is a great way to boost your daily vegetable intake. You will see that I make this as his and hers version. 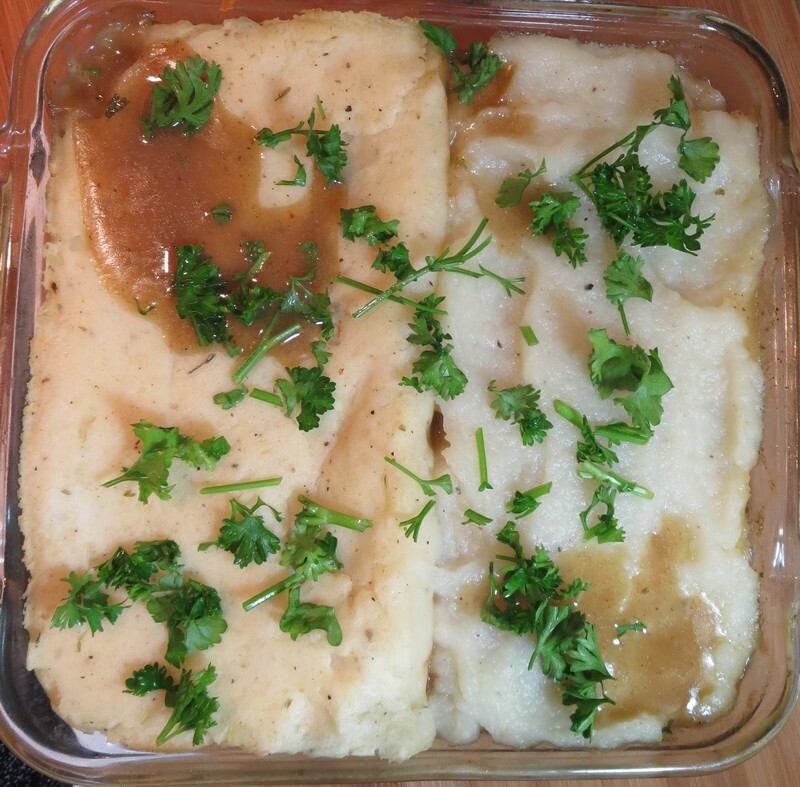 This means that the dish is Paleo and High Fat Healthy Carb for me on my side topped with pureed cooked turnips and my husband’s side is topped with his favorite mashed potatoes. You can choose one or the other, or make two toppings like I do to keep everyone happy at dinner! The recipe below includes ingredients and instructions for making both toppings but you have the option of making more of the turnips or the potatoes (or even using mashed sweet potatoes instead) and using just one topping if you wish! 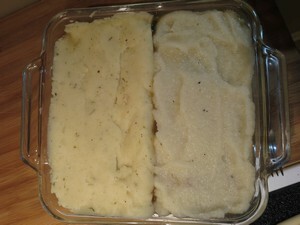 You will also notice that I use half of the filling for the Shepard’s Pie and freeze the other half of the filling for a shortcut to dinner some other time. You might decide to make one large baking dish of this at one time for a large family meal. My youngest daughter loves this recipe an often requests it for her birthday dinner! This is a great recipe to make including kids in the prep as they can wash and help prep all the veggies. Encourage kids to sample the raw veggies while prepping the meal. This recipe may seem involved, but it makes a lot and is great for leftovers and a second meal the following week. Batch cooking really is a great way to plan ahead for ready-made healthy meals. I will make this for friends who need a meal (new baby, coming home from the hospital, during cancer treatment, etc.) because I can make enough for my family at the same time. 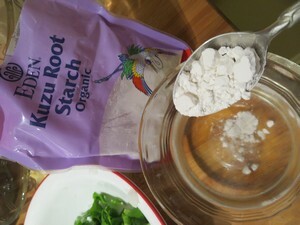 I also really like using Kuzu starch as a thickener in my Paleo and Low Carb Healthy Fat meals. Kuzu starch is a resistant starch that has been shown to decrease risk of colon cancer and is fantastic food for your gut buddies (bugs). 2-4 tablespoons of avocado oil for pan frying vegetables. ** double these ingredients if you are making this for one large family-size serving – use mashed sweet potatoes as a great alternative option! Assemble and prep all the fresh vegetables as per the ingredient list. You will need one large frying pan and 2 medium size saucepans or pots. Fill the pots ¾ full of water and turn to medium heat to begin to heat the water over medium-high heat. Next find the baking dish(es) you will use for the pie. I use a glass 8-inch by 8-inch square dish, lightly greased with coconut oil spray. I also set out a 5-6 cup glass container to put half of the mixture in to freeze for later use. You may choose to do the same. If you are making one large family size serving remember to increase the amount of turnips and/or potatoes you use and use a 13-inch by 9-inch baking dish. 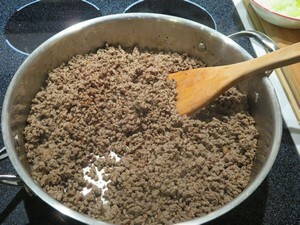 After you have browned the ground beef transfer it to a heat proof container and set aside. If the ground beef has more fat than you prefer you may decide to strain some off as an option. If the meat you are using is pastured fed and finished the fat is good for you. If you are using conventional ground beef you will want to strain off the fat as it contains hormones and toxins from the animal’s diet. You will be multi-tasking a bit here. 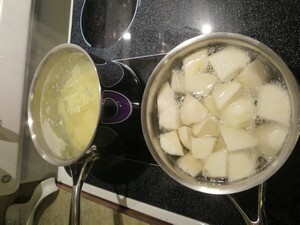 Place the prepared potatoes in one of the pots of simmer water and the prepared turnips in the other pot. Adjust heat so both pots are simmering while you prepare the filling ingredients. You will occasionally test the potatoes and turnips until fork tender. 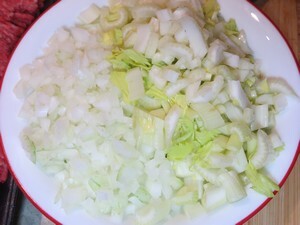 Then turn off heat, drain off water and keep warm until you are ready to finish the pie toppings. Potatoes usually take 20-25 minutes to cook and turnips usually take a couple more minutes. Use the same large frying pan you cooked the meat in. Preheat about 2 tablespoons of the avocado oil until it just begins to shimmer on medium heat. 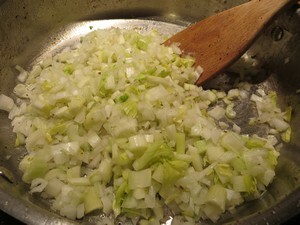 Add the onions and celery, reduce heat to medium low and stir about every 30 seconds until the vegetables are translucent – about 5-6 minutes. Stir in garlic and carrots and continue to pan fry for about 3-4 more minutes, stirring often. Adjust heat to avoid smoking or burning. Add additional avocado oil if needed. Set vegetables off the heat while you do the next step. 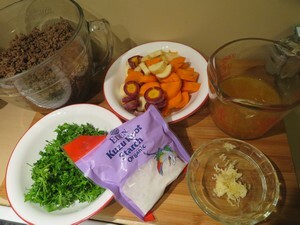 Combine the kuzu starch in a small bowl with the ½ cup filtered water. Stir until kuzu is dissolved. This is a great job to give your kids if you have any around. 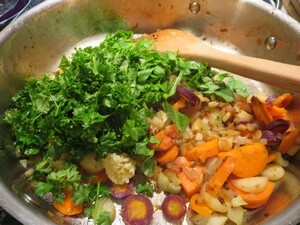 Set aside for a minute while you return the vegetables in the frying pan to the heat. 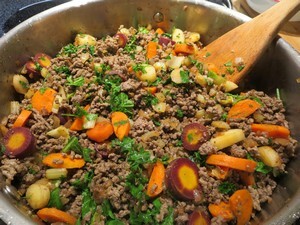 Stir in the parsley (reserving several tablespoons for garnish), other greens of your choice and the ground meat. Stir to combine. Next, stir in the bone broth and 2 cups water. Now stir in the dissolved kuzu starch and water. Increase heat so the liquid begins to bubble, stirring constantly. Season as desired. Turn off heat and let sit while you finish preparing the toppings and get the oven ready. Mash your potatoes using a hand mixer or potato masher and add enough cream or canned full fat coconut milk to create your desired consistency. 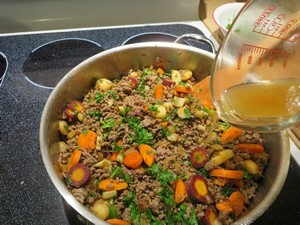 You will want to be able to spread the potatoes on top of the meat mixture. Season as desired. Turnips do not mash really well, so place them in a blender container or Nutribullet and blend until pureed smooth. Add cream or full fat coconut milk to thin as needed but you should not need much as turnips have a high water content compared to potatoes. The turnips will be thinner than the potatoes so do not be worried about this if you are making both. Season as desired. 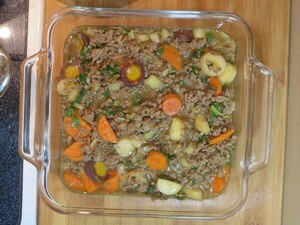 Assemble and bake (or freeze a portion): Place half the meat and vegetable mixture in the square baking dish. Spread the potatoes over half the meat mixture and the turnips over the other half. Place in the oven to bake. Meanwhile place the remaining meat mixture into a glass storage container, let cool on the counter for 30 minutes, then cover and place in the fridge to cool for a couple of hours, label and freeze. Bake for 25-30 minutes, remove from oven and let sit for 10 minutes. Top with reserved parsley and serve. If you opted to bake the whole recipe in a larger 13-inch by 9-inch baking pan increase baking time to about 45 minutes.